THE Prescott was designed as the direct result of two lines. Two lines that defined a roof. To this was added the idea to create a house with an attached garage but still make the house as beautiful as possible. To this end we tried to maintain large porches, large overhangs, and large rooms. It's as if you step into a meager stable door only to find a complete world inside, much larger than the confines of the stable itself. But this is no stable. The great thing about this house is it's ambiguity. "Wait, that's a GOOD thing?" Most certainly! You see, the house can face the street from either end. The "front" in this case has a garage and a large front porch. But maybe your lot has an alleyway. In that case just flip the house around. The new front has a large front porch and a simple craftsman aesthetic. From either approach the downstairs is open and includes amenities such as a powder room and a generous pocket office. Upstairs are the customary three bedrooms and a bathroom. "Hold up again, one bathroom?" Well, yes. 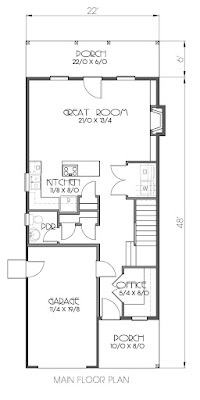 But if you would like two separate bathrooms upstairs we would be happy to work out another version of this plan with small bedrooms, small closets, and cramped bathrooms. See, we think that the paradigm is shifting to the point that a single bathroom serving all bedrooms is acceptable, so long as another toilet is available in the house. 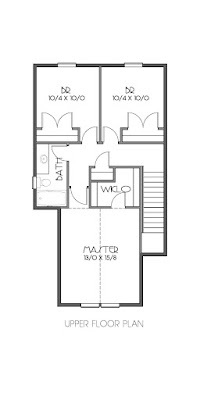 Or we could kill the dormer, add more space, and be another cookie cutter home in another cookie cutter subdivision. No thank you.